I wasn't aware of that intent. I thought it was just supposed to be the muscle car version of the chopped and channeled Enterprise of the first movie -- which to me reads as the over-designed parody! I did mention the idea behind the Excelsior previously in this thread, but I'll reprhrase here so people don't have to search. While I certainly understand (and at times share) your thoughts on the redesigned Enterprise, JB, you do seem a bit in the minority, as many people love that design--and the films work under the conceit that it's a successful design (and basically the same ship as the original). Although, as I've noted, more and more I see that it doesn't hold up to the original. Anyway, that said, the idea was that the revised Enterprise was the Real Deal, and the Excelsior, while supposedly the new Queen of Space, was not able to defeat the trusty old Enterprise. 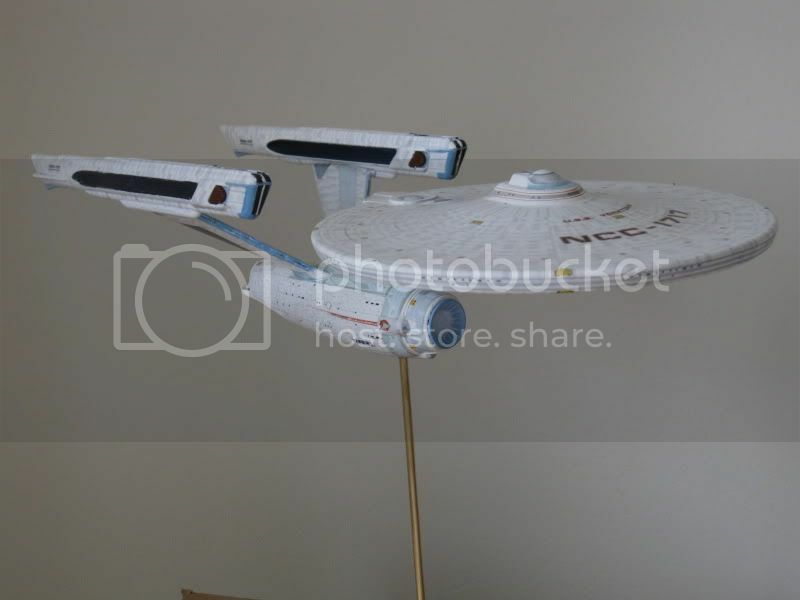 The Excelsior was intentionally designed by ILM modelmaker Bill George to be a Japanese-inspired parody of the Enterprise--too curvy, too much repetitive detailing, and too MUCH detailing. The ship is almost twice the theoretical size of the Enterprise--it's a study in taking the movie Enterprise's design elements and making them as excessive as possible--lots of phaser banks, an exaggeratedly elongated secondary hull, etc. Even the registry, NX-2000, says "experimental" and brings to mind the then-upcoming year 2000--which arrogantly screams "wave of the future!". And, of course, her Captain is a pompous jerk who carries a swagger stick, while the ship stalls out after some simple sabotage by Scotty. Director Nimoy went about making this supposedly great new ship look somewhat ridiculous and ineffectual. Also, the reaction of our heroes (and many fans) to Excelsior was, "That's the future? No, thanks." --which was the intent behind the design. And yet it has since become a beloved design by many fans (which baffles me), and was even the basis for the Enterprise-B. Sure, it seems clear that the Excelsior was reused and/or renamed many times due to budgetary considerations ("Sulu needs a ship? Okay, just use that model we already have! "), but it irks me that the the design became such a part of TREK lore--lasting into the TNG/DS9/VGR era. 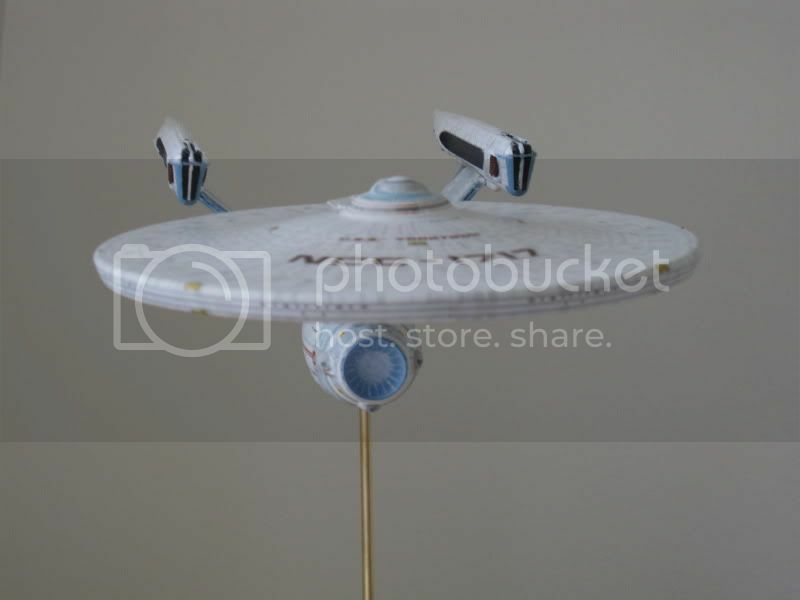 But I do like the Excelsior as the joke it was originally shown as, and would enjoy building a model. I guess the "joke" was lost on me. I see no point in introducing a new ship, only to show how inferior it is. Of course, that was sort of what TREK became all about, when the movies started, wasn't it? The chopped and channeled Enterprise had all kinds of teething troubles, leading to the question of why this "refit" was thought to be such a good idea. I guess everybody was still recovering from that off-screen Galaxy-wide technological crash. A) Set up a bit of "us vs. them" conflict in terms of our heroes going rogue during ST III. B) Make the trusty old Enterprise and her crew look better and more heroic by comparison since they manage to sabotage and evade this supposedly great new ship. Basically, the age and change motif begun in TWOK is continued here. The battle-scarred, aging Enterprise pulls into Spacedock (to the shock of Rand and the other people watching), while Excelsior (which is essentially her replacement) is waiting in the wings. But our heroes chafe at the thought of another, newer ship that's supposedly better than the Enterprise, and are uncomfortable with the prospect of Enterprise now being obsolete and decommissioned. However, the rest of the film goes on to show that Excelsior isn't all she's cracked up to be (hence the "joke" nature of the ship), that the Enterprise is, in the end, a tool that can and must be sacrificed to save lives, and that our heroes can still make a difference--even in their golden years. I guess Sulu really got screwed when he was handed the top job aboard the Excelsior, huh? 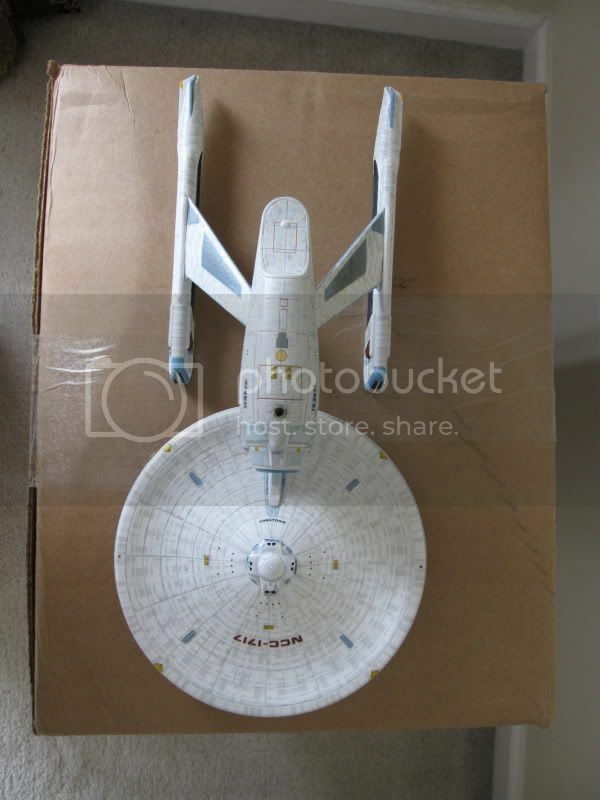 Incidentally -- "The Excelsior was intentionally designed by ILM modelmaker Bill George to be a Japanese-inspired parody of the Enterprise--too curvy, too much repetitive detailing, and too MUCH detailing." That sounds to me like a description of the Enterprise D! That's something I've found interesting. Excelsior is touted as the wave of the future--but she proves to be not all she's cracked up to be when the Enterprise evades her due to Scott's sabotage. Interestingly, Sulu seems a bit excited when he sees the ship ("She's supposed to have transwarp drive"), and later, in ST IV, before the Enterprise-A is revealed, he says, "I'm counting on Excelsior" as their new ride. Methinks these are possibly references to the deleted dialogue from TWOK, in which it is revealed that, after the Enterprise's ill-fated training cruise, the newly-promoted Captain Sulu was to take command of Excelsior. Sulu seems to be the only one who likes Excelsior, and he's eventually given command of the ship. 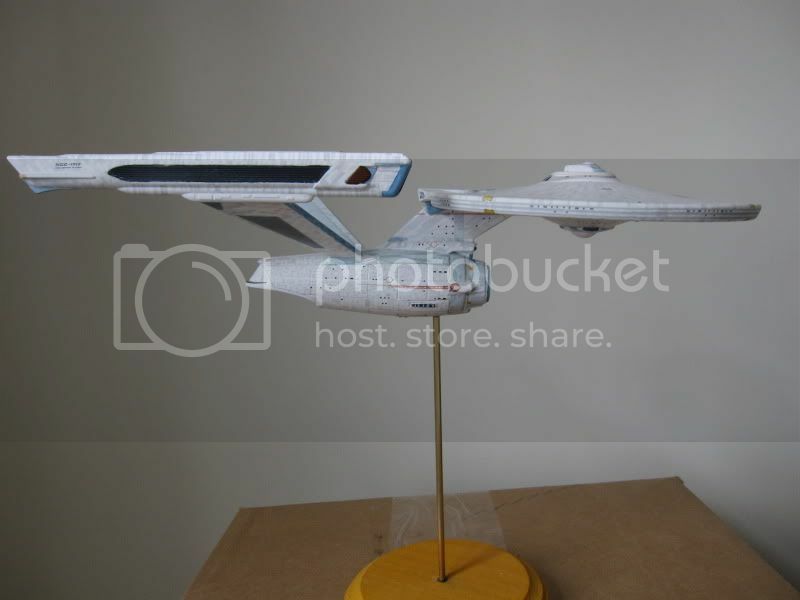 The model was slightly modified for ST VI (and the transwarp drive concept dropped), so she was presumably overhauled and improved after the Spacedock fiasco in ST III. Andy Probert, designer of the "D", did use Excelsior as a design influence. Which is kind of missing the point! Also, the "C", designed AFTER the "D", is even more Excelsior/Enterprise-B-ish. There does seem to be a distinct design evolution when you put them all together. Guess which one doesn't belong? Again, I find it a bit sad (and also rather telling in regards to the franchise's direction) that Excelsior, rather than the Constitution-class, proved to have the longest shelf-life and design influence on future ships. 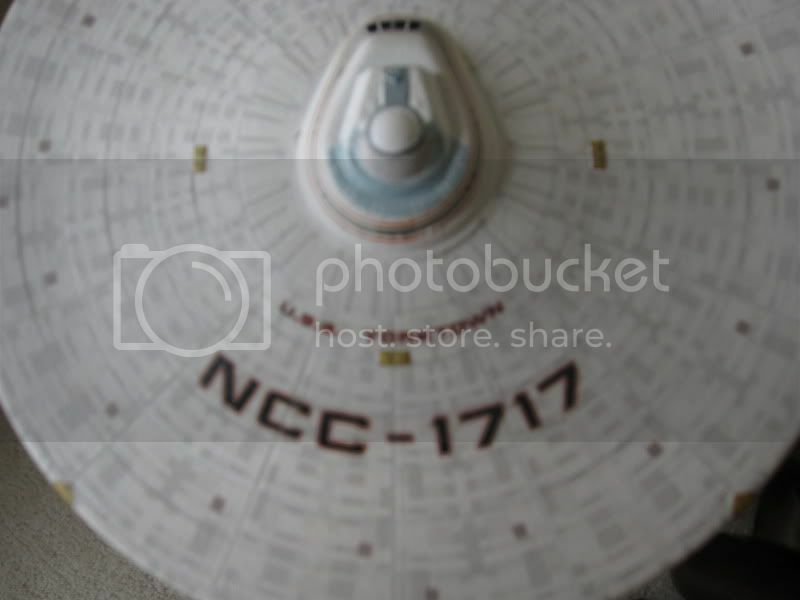 I know I'm biased, but I look at those ships and it's still the original NCC-1701 that looks real and solid and practical. The rest all look like what they are -- later generations pursuing the "cool" factor. Agreed. Nothing beats the original! However, I do also like the Refit/A, since it retains the same BASIC look and feel, while adding additional "realistic" details deemed necessary at the time. I don't mind the extra detailing on this version. But not one of the other, over-detailed designs does anything for me. 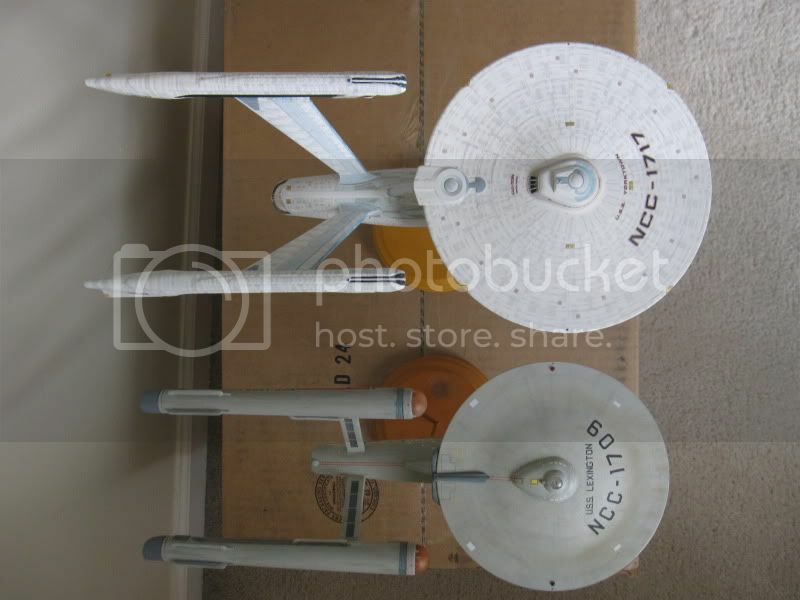 And, as stated, I like the original, jokey Excelsior, but the Enterprise-B revision is rather ugly. Some people say that the original Enterprise is part of the outdated, old-fashioned, "smooth rocketship" wave of the 30s-50s, but it really does represent a lot of careful planning and stylistic choices. Matt Jefferies was an engineer and an airman long before TOS, and he brought a clean, functional, futuristic look to everything he did. Most--if not all--of the later designers were, well, movie and TV production designers. Excelsior/Enterprise-B was designed as a parody of the Refit Enterprise. Enterprise-C was designed as a transitional step between Excelsior and D.
D's design was based on a "future starship" concept painting. E's design was a mix between an elongated version of D and the original Jefferies design (the long nacelles, etc.). NX-01 is a*koff*ripoff*koff* variation of the Akira class design, with elements from TOS, TMP, and TNG mixed in. 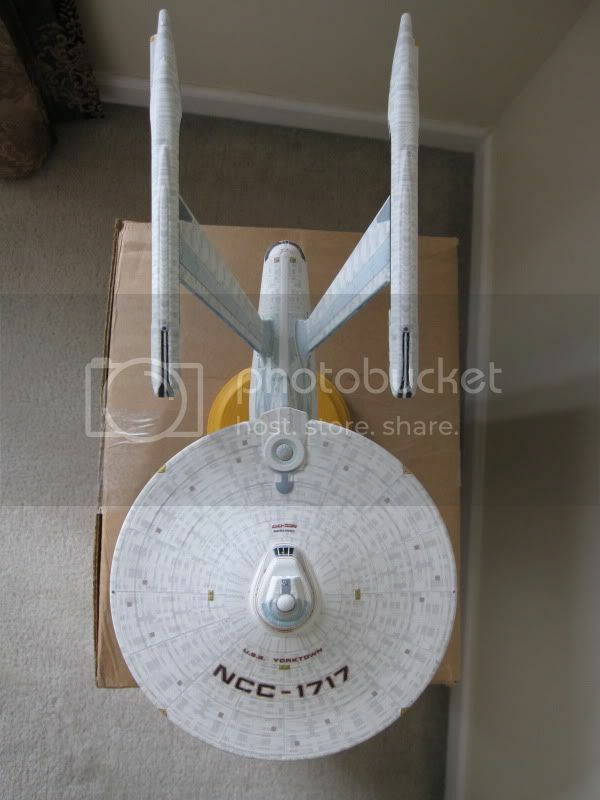 Nu-1701 is a curvy kitbash of TOS and TMP. The TOS Enterprise exterior is clean and simple because space is so unforgiving, and thus essential parts are kept on the inside for ease of maintenance. 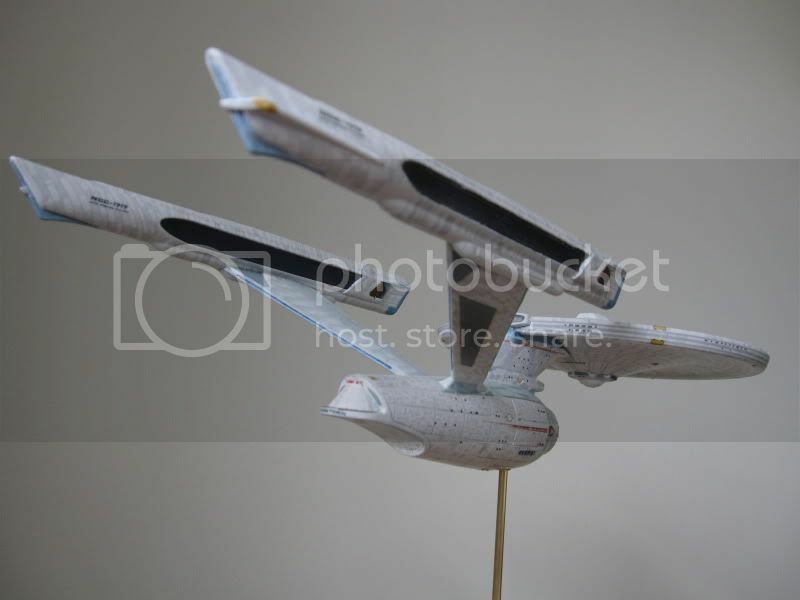 And the simple design makes it look like major parts (like the nacelles) can be swapped out with ease. There are no visible weapons, reaction-control thrusters, etc. Aside from the windows, navigation lights, and technical markings/hatches, the exterior is very simple. The Refit (initially redesigned by Jefferies as smooth and simple), while still pretty sleek, has visible phaser banks, visible torpedo tubes, gangway and personnel hatches, docking ports, deflector gridlines, lots of navigation blinkers, and spotlights for the registry markings. The later ships, added even more detail, and the components are so curvy and integrated that it's hard to imagine an easy job of swapping them out. Received the Acreation aztec decals today. Very impressive! More color and more detail than the stock decals. I look forward to applying them soon. And hopefully, the registry markings will come soon. The only downer is that some areas I painted based on the kit instructions are already covered by these more comprehensive aftermarket decals. D'oh! I think I like Probert's original concept painting better than the finished product. Round2 has also listed their supplemental decals for the 1/1000 Refit, though they won't be available until October. So, I had a bit of a distaster. The Acreation decals proved very thin and easy to fold-in on themselves, and my initial attempt at application was a mess. But the decals LOOK great--the aztec is very subtle, and replicates a faux-pearlescent appearance very successfully. I've since learned that I need to seek out liquid decal film and other materials in order to work with such delicate aftermarket decals. So, I scrubbed the decals off, and ordered another set--which Acreation was kind enough to give to me at half-price. But this build is becoming too sloppy for my tastes--I've decided to write it off as a practice run, finish it with the stock decals, and label it as another ship (much as with my TOS-era Lexington, which didn't turn out well enough for me to comfortably name it Enterprise). In terms of canonical choices, there's really only one option--and it's one that's particularly appropriate, as well. I've learned a great deal from this build, though, and I'll be starting on a new Enterprise-A very soon. Most of my problems came from the painting stage--and now that the Acreation decals are no longer an unknown quantiity, I can be much better prepared for a second attempt. My aztecs & registry decals arrived while I was gone for the weekend, and they do look impressive (a big step up in quality from that earlier 1/1000 refit decal set from the SSM store). Do make the effort to use Testors Decal Bonder spray and/or liquid decal film! I've been working on my poor little kit with the stock decals today--they're way thicker and easier to use--but they will not provide nearly as impressive results as my aborted attempt with the aftermarket set. I'm kinda rushing through it so I can just get this one done and began preparing for my next attempt. I'm going to have to go VERY slowly on my second attempt, but the results should be very nice. Yeah, I've been reading the 1/1000 refit decal thread over at the Starship Modeler Forum today... Wow. Sounds like I'll build one of the refits as a stock kit first before tackling the Acreation decal version (and thanks for the tip on the decal bonder spray). That's what I recommend--I've learned a lot from my first attempt. Getting to know the kit first allows for the proper experience and planning required for another attempt. The stock decals are pretty easy to work with--very thick. I'd have gotten better results with them if I'd gone more slowly, but I just wanna get this build over and done so I can lick my wounds and plan ahead. And I must say that I think I may have to do my next build in subassemblies (although I prefer building a kit whole and then detailing it)--there are so many decals and so much detail that it's hard to work in the tighter spaces with an assembled model. And the Acreation decals are great, my problems aside. What it comes down to is that aftermarket decals are much, much thinner than kit decals, and need special care (as well as aids like bonder spray and liquid decal film, which toughen them up a bit) to be used correctly. My mistake was going in too fast, and assuming that they'd be easier to work with. Next time, I won't make that mistake! I look forward to getting better results with the Acreation decals. The stock decals are impressive for a mass-market kit, bit the aztec is too pronounced for the scale--almost garish. The Acreation decals (the results of which I did see during my failed first attempt) are much more subtle, and better replicate the pearlescent look of the filming model. In the meantime, I won a vintage Excelsior kit on eBay (which I went after because there won't be one coming from Round2 anytime soon), and will soon begin gathering parts and decals (Acreation is working on a set for this kit, as well). I'll think I'd like to do the original NX-2000 version. Well, I'm in the final stages of finishing this model. After an 8-hour decaling session, I finished up with the stock decals. I also ordered JDecals' alternate registry sheet. Hey, Bill--although the printing is not the best compared to the stock decals, they do lay down well and look nice. "Starfleet Command, this is Captain Joel Randolph of the Starship Yorktown reporting. Emergency channel Zero-one-three-zero, code red. It has been three hours since our contact with the alien probe and all attempts at regaining power have failed. All non-essential crew have been given hiber-sedatives to slow down consumption of life support reserves. Our chief engineer is attempting to deploy a makeshift solar sail with which to focus and absorb radiation from a nearby sun we are orbiting. We have high hopes that this will, if successful, generate power to keep us alive indefinitely. If you would patch us through to Engineering Control we could link up with the technicians there and hopefully lick this problem. We will keep you posted on our condition, Starfleet, and inform you of any further developments. Captain Randolph out." And so, my experimental build is done. I chose the only truly canonical Refit ship other than the two Enterprises to appear in the movies (and even then, we don't see the ship itself, just the above report made by her Captain). And I found it somewhat appropriate to label my failed Enterprise-A as the Yorktown, since it's been conjectured that the Yorktown was renamed Enterprise at the end of that film. I've learned quite a lot from this build, and will apply the experience to my Enterprise-A. It turned out quite well, despite painting problems, and a rush-job with the decals (after things started going a bit south, I just wanted to be done and start on the next one). Underscores the word that most often comes to mind when I see the "refit" compared to the original --- frail. Just out of curiosity -- what exactly is all this "aztecing" supposed to represent? On real ships, the effect is unpainted metal, and comes from the different textures of the hull plates. 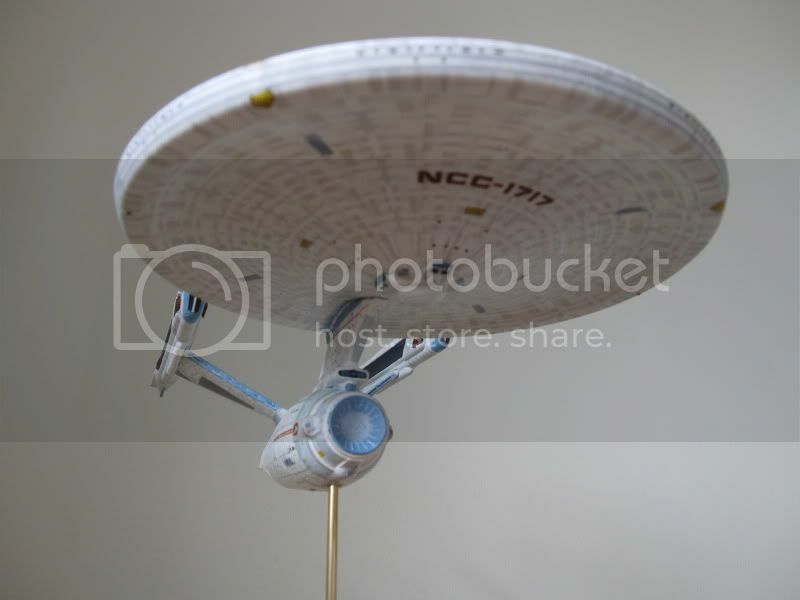 I thought these Star Fleet ships were not even supposed to HAVE hull plates! 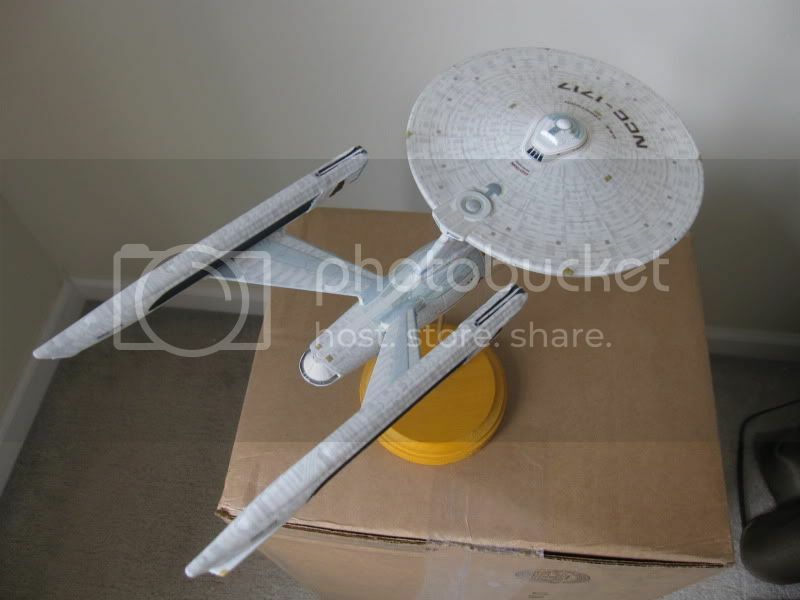 Wow, Greg... For a moment there I thought you posted photos of the prepainted Bandai USS Enterprise kit! The stock decals are certainly more pronounced looking, but not as bad as I imagined it (hence the Bandai kit comparison). Gives me a little more confidence about building the stock kit first and not messing it up. I'm guessing the Acreation decal sets will have more of a subtler hull effect that we've seen in the movies. Yeah, the hard angles of the original's nacelle pylons, in particular, convey STRENGTH and FUNCTIONALITY. I do think the Refit's pylons and engines look good from some angles, though, it not all, unlike the original. That said, I think the beefed-up secondary hull and saucer don't look so frail. It's the more artsy engines and pylons that make the Refit ship look less like a utilitarian muscle car-type ship than the original. Quibbles over the design aside, that model is one of the finest of its kind ever built, and it's truly sad that the original, magnificently layered and subtle paint scheme from TMP was dulled down and repainted for the subsequent films. 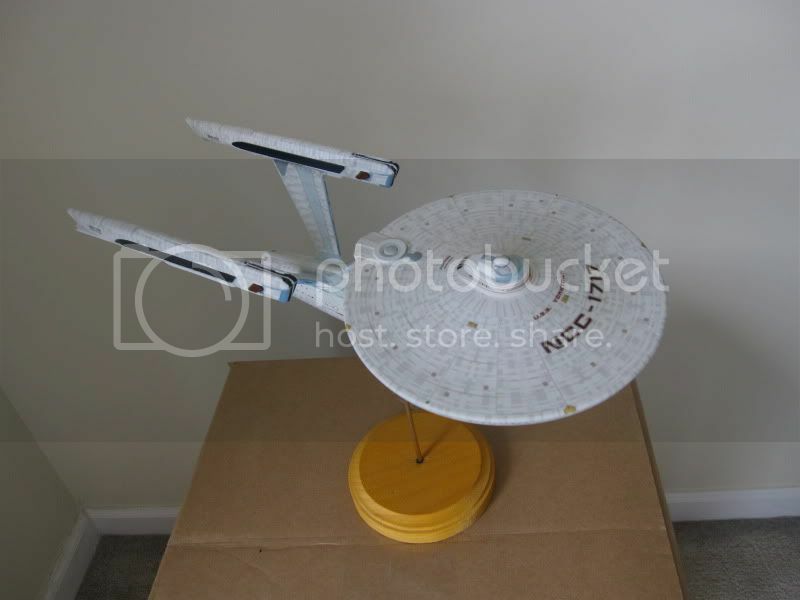 And, of course, the TOS version's hull is a uniform gray-green color. So, is the hull just painted? Did we just not see all the detail that was on the "real" ship? I personally feel that since such extra detail could easily have been added to the original model, but wasn't, Jefferies clearly intended for the ship to either be painted, or have no visible seams in the hull (as if future technology allows for seamless welding of hull plates, or entire skin sections which can be "cast" and attached to the spaceframe whole). And then they added hull plating to the CG Remastered model. Bleh. From a distance it looks good, but up close it's a bit much. And, yeah, based on my failed first attempt with the Acreation decals, they should be much more subtle and colorful. I'm just sad I couldn't apply them to this build! But I know how to proceed now, and Attempt # 2 should be much better. Speaking of design elements, I found this article very interesting when I discovered it some time back. 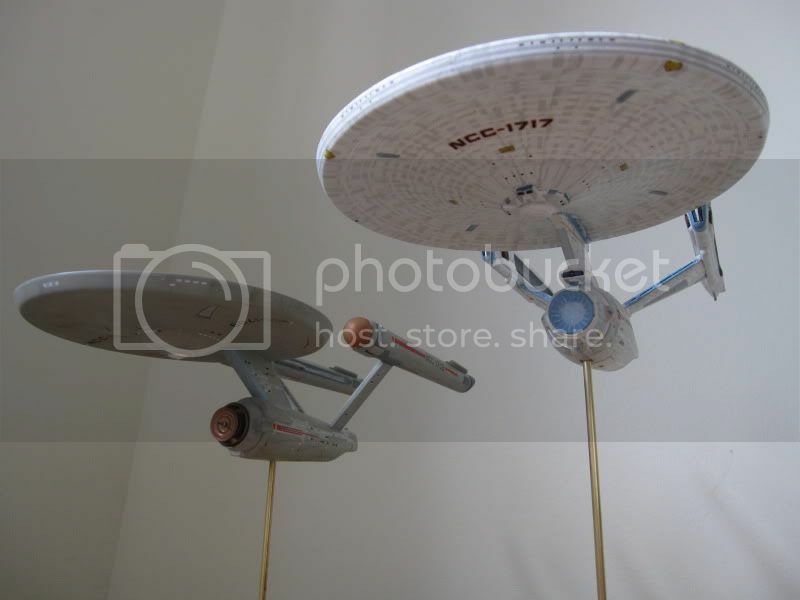 The original Enterprise (and the Refit) embody the mathematical concept of the Golden Ratio when viewed from overhead, and are therefore aesthetically pleasing, whereas later incarnations don't follow the theory, and are less than pleasing.